Derek Johnson, in recognition of your tireless efforts as an activist and volunteer, the Cornell College Alumni Association has elected you as a Young Alumni Achievement Award winner for 2014. You demonstrated an ease with leadership and engagement even as a student. You were elected to leadership positions on Student Senate and Media Board, served as editor of The Cornellian, and participated in Cornell Literary Society, Open Field, and Littera Scripta Manet. Peace Foundation in Tokyo to advance global interfaith dialogue and collaboration. Your passion for human rights led you to Global Zero, a global initiative dedicated to the elimination of all nuclear weapons worldwide. As executive director you travel the world to work with international political, military, civic, and faith leaders. You remain committed to grassroots efforts as well, mobilizing college and high school student organizations across the globe. And this year you have been selected to join the Young Munich Leaders group of rising stars in foreign and security policy at the 2015 Munich Security Conference – the world’s preeminent forum for senior government officials and civil society leaders dedicated to peaceful conflict resolution and international cooperation. From hiring numerous Cornell graduates at Global Zero, to service on the Alumni Board of Directors and as a pre-law mentor, and as coordinator of the Cornell College Club of Washington D.C., your commitment to the Hilltop has been unceasing. 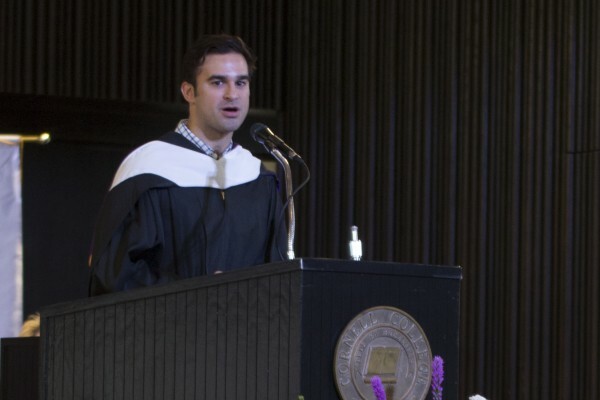 Derek, your commitment to human rights and service exemplify the highest ideals of a liberal arts education. On behalf of the Alumni Association Board of Directors and the entire Cornell community, we are honored to recognize you with the Young Alumni Achievement Award.